So, it seems that all I have to do to improve my cooking skills is write a series of blog posts saying how much I dislike the task and how bad I am at it (see Not a domestic goddess and The making of an incompetent cook). Not that I am now claiming to be competent and skillful. I will leave those accolades to my amazing friend Mrs Gillybird who can produce creations such as this: A Cake Fit For Angels. Still, this afternoon I was feeling in a positive mood and decided to make bread. I am rather pleased with the result. This is a loaf of Irish wheaten bread, made using my mother’s recipe with a few adjustments to allow for the fact that not all ingredients are readily available in this part of England. 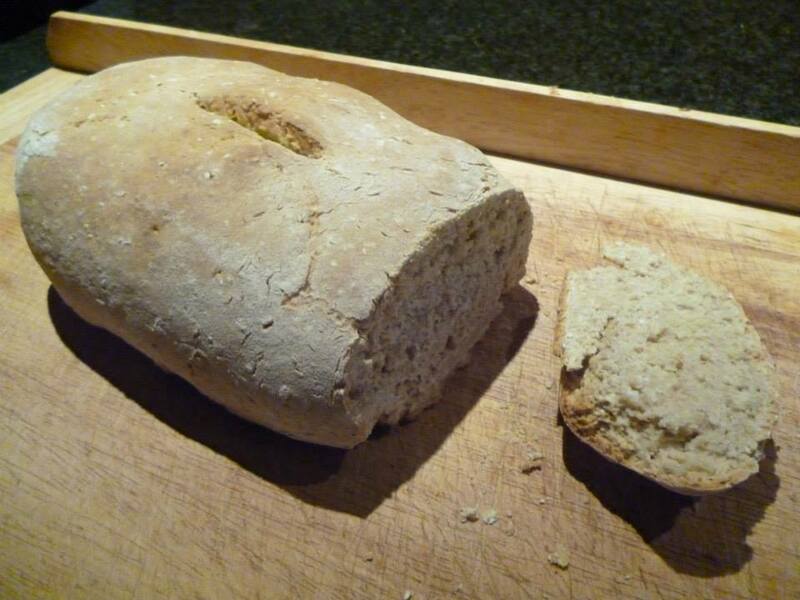 I used to make this bread regularly, until I had a run of unpalatable failures and lost heart. I was inspired to try again recently by a blog post written by Vernacularisms titled Well Raised. I asked for advice and tried his suggestions with great results. Isn’t the internet a wonderful thing? Interactions with strangers get such a bad press but, just as in the outernet, the people that I encounter are mostly decent, thoughtful, supportive and willing to help out when they can. Buoyed by my recent successes in a few areas of food production, last week I tried out a recipe that I came across on a fabulous blog written by A Girl Called Jack: Carrot, Cumin & Kidney Bean Burger. These went down very well with my fussy little family, were easy to make in advance and quick to cook when required. I will be searching for more recipes on this blog. Jack cooks on a tight budget so does not use the sort of ingredients that are hard to come by (unless you are willing to pay Waitrose prices or have access to the sort of upmarket deli or street market that seem to exist in the posher parts of London where many of the popular food writers seem to live). Maybe I just order my shopping from the wrong places, but my store cupboard is pretty basic and I like it that way. I made a curry for dinner this evening and there were no complaints, not even from my spice averse youngest. I really am on a roll. Perhaps my children were distracted by the prospect of pudding as my younger son had made a cake and a batch of cookies when he got in from school. Whatever the reason, producing food is much more rewarding when the results turn out as they should and are then eaten without complaint. I will be interested to see how long I can maintain this run of good results. This entry was posted in achievement and tagged cooking, family, satisfaction. I have just come across your blog and I am really pleased I am not the only one who occasionally has a bad run on the cooking side of things. I love cooking but despite my best efforts the only thing I seem capable of doing well on the cake sort of front is banana bread! Might have to look at A Girl Called Jack myself. I tend to stick with dishes that I have tried many times so my disasters really bring me down as I can rarely understand what went wrong. Success encourages me to try new things, so long as they sound simple enough. A Girl Called Jack uses good, basic ingredients and gives tips to help get them right. This suits my way of cooking nicely. Which Buttermilk substitute did you use? So glad the bread worked. Looks yummy.